For Melania Trump's second Christmas season in the White House, she decided to strike a different chord not always immediately associated with the holidays: patriotism. 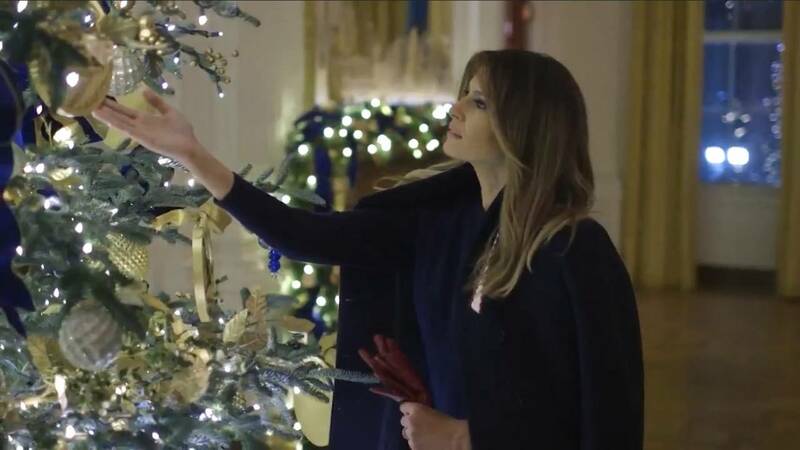 (CNN) - For Melania Trump's second Christmas season in the White House, she decided to strike a different chord, not always immediately associated with the holidays: patriotism. "This year's theme, 'American Treasures' honors the unique heritage of America," said an announcement from the first lady's office, adding the entire decorative endeavor was designed by Trump. "The White House shines with the spirit of patriotism." Throughout the displays, of which there are several in the public and state rooms of the White House, there is an overarching theme of red. Red topiaries line the colonnade joining the East and West Wings, each of the 40 trees covered in thousands of different sized real cranberries. In the Cross Hall, which connects the East Room to the State Dining Room, 29 trees are hung with more than 14,000 red ornaments, the ceiling lit up with an elaborate lighting display of holly and berries. And in the Red Room, Trump has decked out the trees and wreaths with ornaments and pencils emblazoned with the red (and blue) logo of "Be Best," her official platform, which centers on helping children. The idea for the color themed came from the "pales," which are the red stripes found in the presidential seal, and are symbolic of valor and bravery, according to the statement. "Our theme honors the heart and spirit of the American people," said Trump. The choice of red was new for the White House holidays, and it came on the heels of last year's Trump-selected theme of white, when branches of white trees were lit along the colonnade, and other portions of the greenery were dusted with a touch of faux sparkly, white "snow." 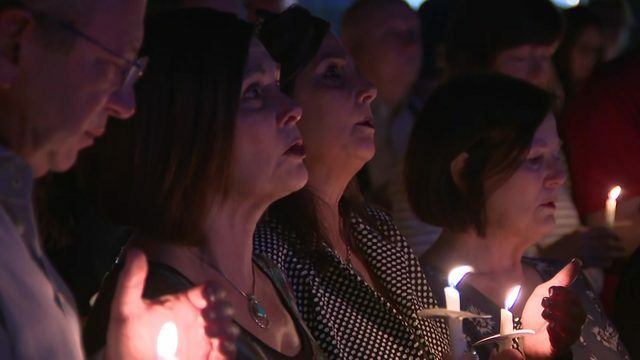 Monday's unveiling drew its share of critics, many of whom were seeing red afterward, comparing Trump's selection of the color as reminiscent of "The Handmaid's Tale," and drew similarities to blood. There are, however, other colors, too. The Green Room is all about the "country's bounty and harvest," the East Wing said in a release, indicating why the tree is adorned with fruits, vegetables and grains. And in the Blue Room, the 18-foot-tall Official White House Christmas Tree, which arrived as is tradition last week via a horse-drawn carriage and was greeted by President Donald Trump and first lady Melania Trump, is covered in more than 500 feet of blue velvet ribbon. The ribbon has been embroidered with gold listings of each state. There is the annual Gold Star Family tree, as well, decorated by families who have lost loved ones in service to the military. And there are even more trees, in various degrees and shades of sparkle, in the Library, the Vermeil Room, and the China Room, where Trump dictated three tables be set with exact replicas from different eras of state dinners, from the Theodore Roosevelt, John F. Kennedy and Trump administrations. As is tradition, the massive White House gingerbread house anchors the State Dining Room décor, only this year, Trump asked that more Washington monuments be added to the edible display, making it more reflective of the entire National Mall than just the White House building. The official White House dessert team used more than 225 pounds of gingerbread to make it. In the East Room, there are four more gigantic firs, hung with dozens of handmade paper ornaments representing the different regions of America. Each year, the holiday decorating of the White House gets a helping hand from dozens of volunteers who come from all over the United States to hang boughs on the mantels, place the ornaments and ensure each display reflects the first lady's vision. Trump thanked the volunteers with a tweet on Friday, sent while she was with her family at Mar-a-Lago in Palm Beach, Florida, for the long Thanksgiving weekend. When Trump returned with the President to the White House late Sunday night, she toured the finished decorations, her spokeswoman Stephanie Grisham telling CNN the first lady walked the exact public tour route that the anticipated 30,000 White House holiday visitors would take to ensure that everything was as she envisioned it would be. Trump, who shared a short video of that behind-the-scenes tour on her Twitter feed yesterday, began planning the holiday decorations last summer, selecting textiles and working up sketches with a design team.